Jack Bauer will return to TV. 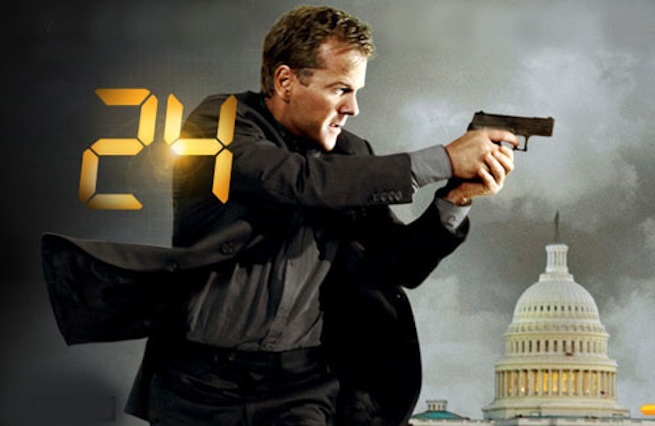 FOX has confirmed that the network will be resurrecting 24 for a limited 12-episode series to air next year. The new season, titled 24: Live Another Day, is expected to be a stand-alone ‘event’ program for FOX, though fans of the series should still be excited, as star Kiefer Sutherland is confirmed to return. The new series will air in May 2014, with each episode jumping around in the day (as opposed to the previous seasons’ real-time formats). With Kiefer Sutherland all freed up due to the demise of his drama Touch, FOX is considering bringing back Jack Bauer for a 12-episode season of 24, reports Entertainment Weekly. The show, each following a grueling day in the life of Counter Terrorism Unit (CTU) agent Jack Bauer, lasted for eight seasons and a movie before concluding in 2010. The news brings up some interesting questions: Does this mean that episodes, which had before occurred in real time, each lasting an hour, will now each encompass two hours? Will the original cast all return, or just Sutherland? What fresh hell will Bauer, who lost his wife to a CTU mole, spent 20 torturous months in a Chinese prison, and was forced to fake his own death during the series’ run, be living this time? And perhaps most importantly, does this mean an end to the possibility of Die Hard 24/7? Hopefully FOX will shed some light on the matter during their upfronts on Monday. This entry was posted in News and tagged 2013, 24, fox, jack bauer, tv. Bookmark the permalink. ← 2013 TV Shows – What’s Renewed, What’s Cancelled?